MRIRN2IM is the Nimbus-2 Medium Resolution Infrared Radiometer (MRIR) data product consisting of 4 x 5 inch photographic film sheets. 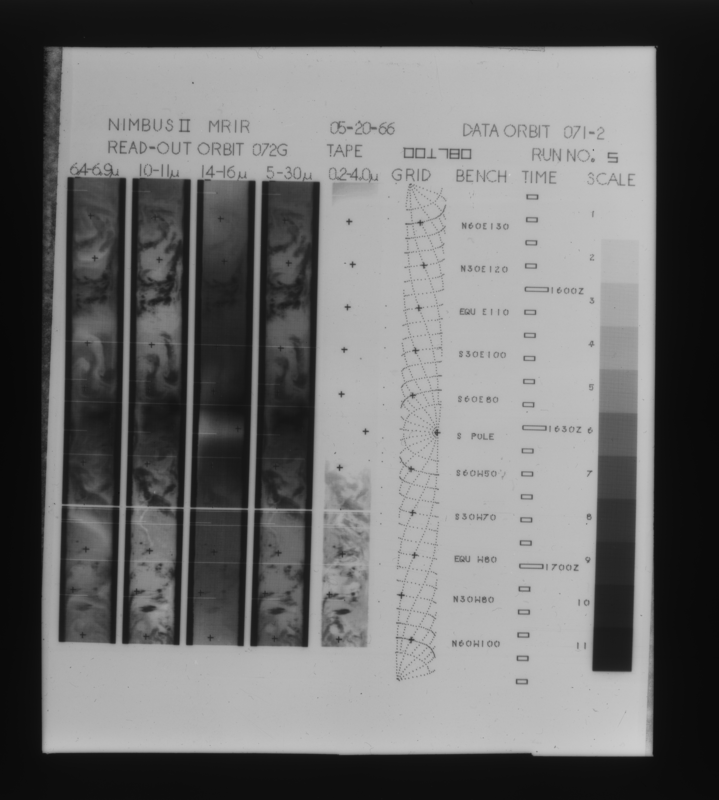 Each film sheet contains an entire orbit (daylight portion) of brightness temperatures measured at five wavelength bands: 6.4-6.9, 10-11, 14-16, 5-30, and 0.2-4.0 micrometers. There are also associated latitude grids, time, and gray scales representing different temperatures. The images are saved as JPEG 2000 digital files. About 3 weeks of images are archived into a TAR file. The processing techniques used to produce the data set and a full description of the data set are contained in section 4.3.4 of the "Nimbus II Users' Guide." The MRIR experiment measured the intensity and distribution of electromagnetic radiation emitted by and reflected from the earth and its atmosphere in five selected wavelength intervals from 0.2 to 30 micrometers. Data for heat balance of the earth-atmosphere system were obtained, as well as measurements of water vapor distribution, surface or near-surface temperatures, and seasonal changes of stratospheric temperature distribution. The MRIR experiment was successful, and good data were obtained from launch on May 15 1966 until the recorder failed on July 29, 1966. This product was previously available from the NSSDC with the identifier ESAD-00003 (old ID 66-040A-04B). These images can be used to supplement the level-1 radiance data files from the MRIRN2L1 data product.